The moving crate on wheels will be no more after 2011! Thank you. 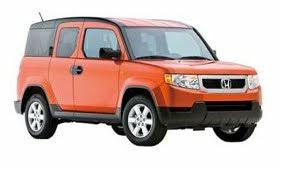 I think the Honda Element is the ugliest car of the current decade. Last summer, I ranted at length about how ugly they were and found out the gal I was ranting to owns one. I remained unrepetent. They are ugly. Good-bye. No. The Toyota Scion, which pre-dates the Element, is the ugliest. They are similar to each other, but the Scion is more directly of the appearance of being thrown together out of spare parts. The Element refined that look and is actually better looking than the Scion. I like Honda and Toyota (have an affinity for Honda) but I gotta say, both companies were hittin' the opium or maybe the LSD when they threw these wrecks into being. These "box cars" are an attempt to get Americans out of mid-size SUV's (they no longer exist; Ford took the last one out and replaced them with jacked-up cars from Chinese automaker Geely have replaced them) and into smaller cars. The attitude of the modern ruling class is to put is into tinier cars such as what they have in Europe is their only feeling. They don't look at anything but city cars. Then they want us to ride the bus. There is no respect for safety in the world of the environmentalist wackos. In their perfect world we're in tiny Scions or Hondas, or even the Nissan Versa. No more big Fords, Chevys, or Dodges.